Metal coil drapery, also named architectural mesh or metal fabric, is another kind of decorative mesh. Usually it made of Aluminum alloy wire, but some times customers want the stainless steel wire or copper wire,that because it is weight than alloy wire and it can’t move when people pass. As to the processing of surface, usually the metal drapery made of Aluminum alloy wire is coated with lacquer , the colour is can be coated various kinds; The processing of stainless steel wire drapery is acid washed, it is suitable for the stainless steel wire. After washing from acid, the metal drapery is very light. Metal fabric find increasing usage in decoration and construction of the following:Wire mesh shade screen; Architectural façade; Curtains; Wire Mesh Partitions; Ceilings; Other decorative use. Benefits: The use of architectural mesh as a cladding material remains increasingly prevalent for a variety of interior façade applications. While the light weight nature and flexibility of metal fabric has always presented a multitude of functional and aesthetic benefits on their own, new visual effects have introduced the ability to take these installations to a dynamic and sophisticated new level. A slightly more subtle effect involves washing metal fabric façades in exterior lighting. A full range of architectural lighting solutions are available for metal fabric systems, including edge lighting, energy-efficient lighting, projection lighting, and an assortment of other options designed to dramatically enhance each metal mesh fabric installation. Metal coil draperycan be installed on the ceilings with aluminum alloy track and pulley with chain, the track can be fixed on the ceiling wall , the pulley can make the metal drapery move easily and the chain can control the pulley. 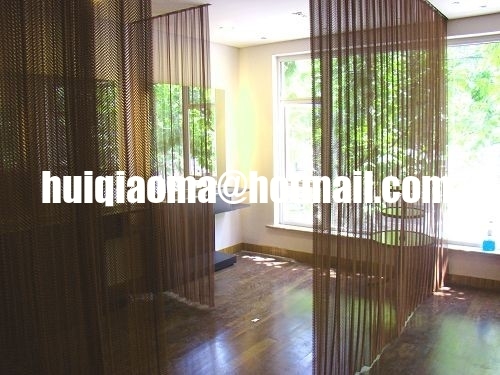 Usually our woven metal coil drapery has 1.5 times or 2 times overlap , when the mesh is hung , it can be show into a wave shape and make the curtain beautifull. As to the track, we have two kind of tracks , one is straight type, the pulley only can be moved straight; the other is bent track, the track can be bent into any shape according to your building shape.